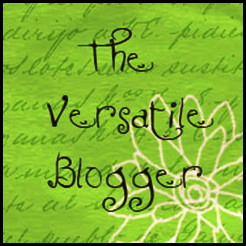 Mz Wonderful, Jane at Janie's Porch, passed on The Versatile Blogger award to me. I am so honored! I really enjoy blogging and meeting new friends. I'm excited that she's a fellow Texan and really doesn't live that far away. Thank you, Jane, for thinking about me! 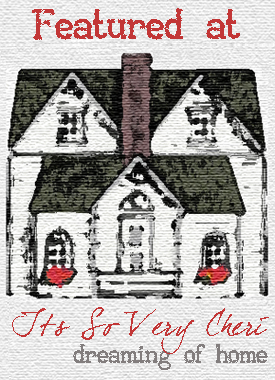 Please stop by her blog...she is an incredible woman who you will enjoy meeting and getting to know better. Pass the award on to (up to) 15 other bloggers who you have recently discovered and think are fabulous. Contact the bloggers you chose and let them know about the award. 1. I think Fall has finally arrived! Our temps have been cooler and supposed to be in the 50's the next couple of mornings...and 80 during the day. Yay!! 2. I have vertigo right now so won't be online a lot, although I've done better today. Allergies usually cause this for me and let me tell you, it is NOT fun! 3. Just can't seem to get my nails to grow and I really dislike the way my hands look without pretty nails. I've been taking Prenatal vitamins (yes, a "Mimi" taking them! ), Biotin, Calcium and using Nailtiques. Any other advice? 4. I'm going to be helping a friend update a house that has been stuck in the 70's. Can't wait to shop and see what develops. Of course, it's not my money so it will be really fun! :-) Choosing paint colors has been on my mind all week-end. 5. Fell in LOVE with so many things at Pier 1 on a recent visit. Tons of great fall/Halloween things to wish for. I did buy a couple of things and my wish list is long. 7. The Cowboys finally, finally won a game today! Hopefully, they are figuring out what they're supposed to do out on the field. The pre-season and first 2 games have been more than embarrassing. So many blogs are award free so I will not be passing this award on like I'd prefer to. You are so welcome to participate if you'd like though. Take the award, share 7 things about yourself and please let me know if you do! Just added a trip to Pier One to my "to do" list! Just love that place!!!! And I am with you on that vanilla creamer....omg....love that stuff! Can't wait for the pumpkin spice creamer to hit the shelves in the store so I won't be spending $4 a pop for a pumpkin spice latte at Starbucks....a girl can go broke pretty quick drinking those yummy lattes. Hope the vertigo passes quickly....I can sympathize since I've have the same problem during allergy season for the last 16 years now. Thank God Antivert is available over the counter now!!! Feel better! I hope your vertigo gets better! Congrats on the award! You are very deserving. I'm taking prenatals too...I'm anemic and low on vitamin D, so I can get both that way. I felt funny buying them! Beautiful share. I love reading things about my blogging friends. You have vertigo, eww so not fun. I will be praying about this for you sweetie. Get well soon, allergies be gone. Pier One is one of my favorite places to go. I could spend a fortune there for sure. Vanilla creamer did you say? OMG, I will be making a trip by there on my Friday off. Look out Pier One. I found a product at Sally's Beauty Supply here in the valley. I will have to look at that bottle later, and email you about it. It has helped my nails grow unbelievably hard and fast, and being an insulin diabetic they have chipped so frequently before. I'll check later and let you know. In case I forget sweetie, email me and I can let you know. I think fall if finally here as it's actually cold and I might not need the AC today!